Surprise! 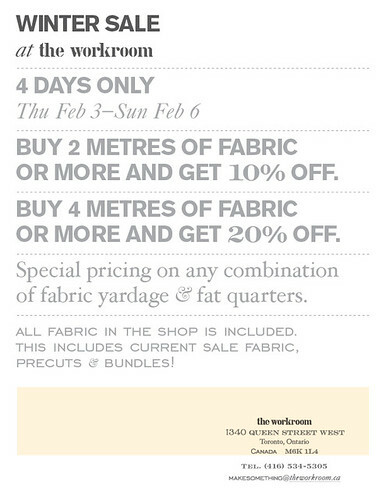 It’s time to shake things up with another big fabric sale at the workroom. It’s February already and I don’t know about you, but planning for spring and making spring-y things gets me through the last few months of winter. Now is the perfect time to treat yourself to some fabric love and plan some happy projects for these cozy winter nights. I haven’t posted ANY clothing pictures for a few months, but I’m about to change that. I have a few back posts of clothing that I need to photograph AND I just finished a cute spring-y top that I’ll be wearing on Sunday at the Love & Rummage 3 Trunk Show. Fabric Sale + Love & Rummage!! It’s going to be a pretty great weekend! Ugh – and I am coming to town on the 8th. They don’t call me “day late and dollar short” for nothing.